In the highly competitive optics market, technology is always advancing. This year, we’ve seen some significant innovations in high-end scopes, plus improved features in more affordable, sub-$1000 optics. The new American-made Revic PMR 428 scope features a built-in ballistic calculator employing a micro-processor and multiple on-board sensors. This really represents a major step forward in “smart” optics. Fans of high-technology should check it out. 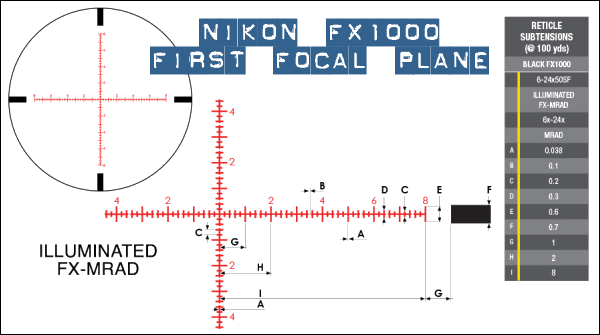 Or, if value is paramount, for less than one-third of the price of the Revic, you can get a new Nikon FX1000 series scope. The 6-24x50mm model offers very impressive features for under $800 — a bargain these days. Ever wish your riflescope could calculate windage and elevation and display the shooting solution directly in the scope image? 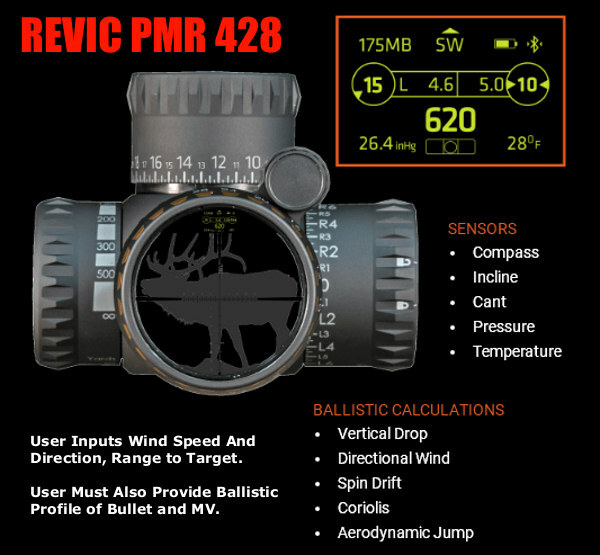 Well check this out — the new Revic PMR 428 scope is one of the most advanced optics ever offered to the public. The Revic has a micro-processor inside, plus sensors for temperature, air pressure, incline and cant (around bore axis). 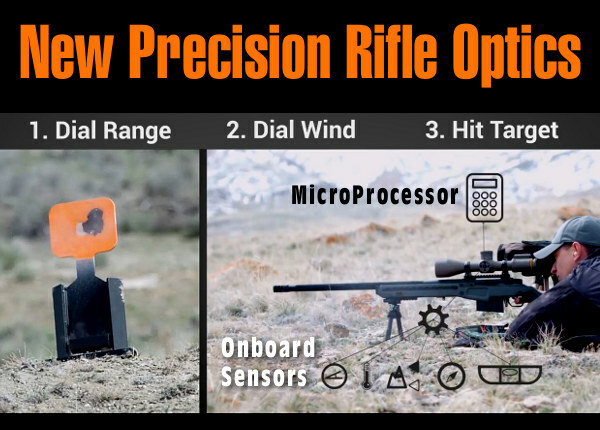 After the shooter inputs wind speed and direction, this allows the scope itself to indicate the correct windage and elevation corrections, plus adjust for shot angle. This really is a Big Deal, and we expect other top-end optics makers to follow suit in the years ahead. Right now Revic offers one 4-28x56mm PMR 428 Smart Scope for $2750.00. In this video, Steve Lawrence of 65Guys.com reviews the capabilities of the ground-breaking Revic PMR 428. Jeremy Bentham, a Precision Rifle Series competitor, joined Nikon a year ago as a marketing manager. 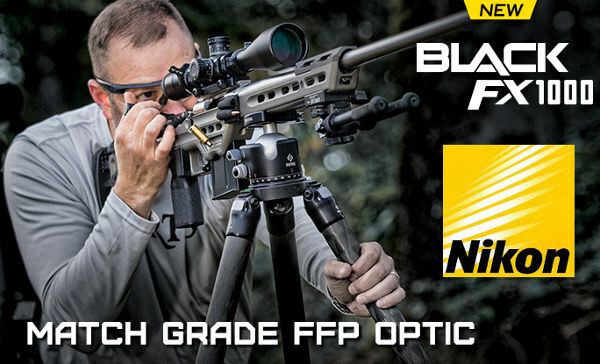 With his help, Nikon is making inroads into the Precision Rifle market with impressive products at very competitive prices. Here Steve chats with Jeremy about the latest offerings from Nikon, which recently celebrated its 100-year Anniversary. Jeremy presents Nikon’s new products for the tactical/practical market: 1) Stabilized Laser Rangefinder; 2) All-New FX1000 Tactical Scopes in 4-16X and 6-24X, with both MIL and MOA versions and optional illumination. The rangefinder is impressive — it eliminates 80% of perceived shake and also offers built-in angle compensation plus extended ranging capability. The new scopes are priced attractively — under $800. Bentham designed the new reticles which are clear and easy-to-use. These optics feature “high-speed” turrets (10 Mil or 25 MOA) with nice, tactile clicks. 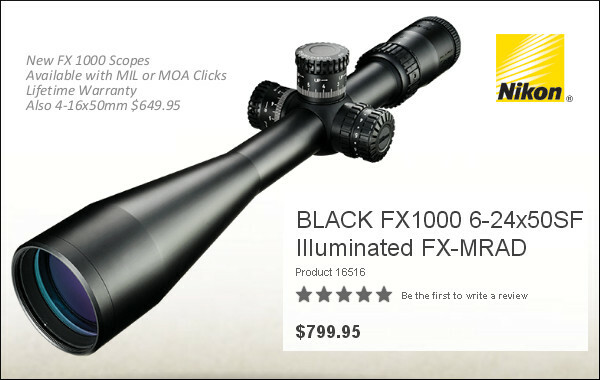 The 4-16x50mm model is $649.95 while the 6-24x50mm is $799.95 MSRP. These represent outstanding value for a big name, life-time warranty product. The 6.5 Guys also checked out the new products from U.S. Optics. For 2018, U.S. Optics is featuring two impressive tactical scopes, the B17 and B25. Ed Mobley of 65Guys.com talks with Jake Vibbert of U.S. Optics. Jake explains that his company offers a wide variety of options, with both MOA- and Mil-based reticles. The B17 and B25 both feature a 34mm main tube, which helps deliver greater elevation adjustment. These B-series scopes offer a fast-focus eyepiece, and a true “tool-less” zero-set option. That’s a nice feature — you don’t have to find an Allen wrench in the middle of a competition. Share the post "Through the Looking Glass — 6.5 Guys Review New Optics"